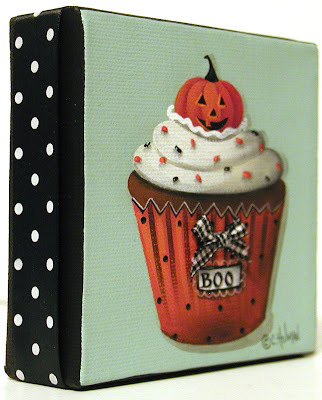 I quickly whipped up two new cupcake paintings this week and listed them on eBay. A Halloween Pumpkin Spice cupcake is decorated with cream cheese frosting and black and orange sprinkles. This Halloween theme continues with the polka dot paper liner and the smiling pumpkin on top. A little "Boo" tag is painted on the paper liner and a black and white checked bow is glued above it. A black and white dotted satin ribbon is wrapped around the edges of the canvas. I realize that it may seem a bit early for Halloween projects, but they sell quickly and if I don't start them early I won't get enough of them finished. A rich dark chocolate cupcake is slathered with butter cream frosting and decorated with red sprinkles. This red and white theme continues with the polka dot paper liner and the striped candle. This painting is great for any type of celebration, especially birthdays. A red and white dotted grosgrain ribbon is wrapped around the edges of the canvas and tied in a bow at the top. I feel a sweet binge coming on! I had my heart set on the lemon cupcake painting for my kitchen and I stupidly waited too long to buy it...so my advice to anyone wanting these, buy them now because they'll go fast! Wow! Catherine, I just love the pumpkin cupcake, and the ribbons finish them off beautifully. Been thinking about halloween paintings myself lately but getting nowhere as yet, lol. Very nice painting as always! Hard to believe that Halloween and fall are so close! I love these cupcakes!! I especially love the pumpkin one-how cute!! Fall is really almost here!! I always feel a sweets binge coming on! LOVE the pumpkin cupcake, so darling. Good news...you won again! You won the birdie pendant. You sure are lucky! Please email me your address and I'll get it out to you. 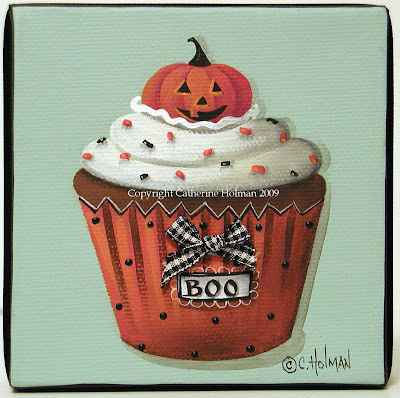 Dear Catherine it is never too early for a yummi Halloween- Cupcake or for one of your great paintings. I love it, as ever! 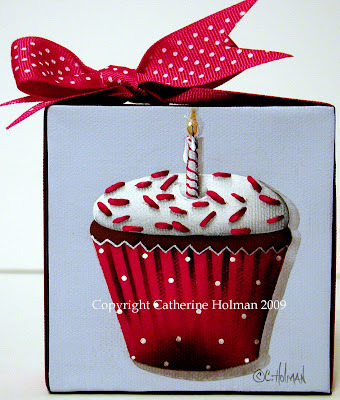 Catherine, the only thing I hate about looking at your cupcake paintings is that they look SO YUMMY they make me want to run out to the bakery and GO WILD! But then my family would have to roll me out the door! LOL! Your work is beautiful as usual! Catherine you are sotalented, I dont know how you manage to "quickly whip up" these paintings, when It takes me forever to paint something! Love the cupcakes, Cathie! I'm suddenly hungry for spice cake. Ah yes, it is getting to be that time when people will be thinking of holidays. Now I'm wondering what you whipped up in the kitchen. I'm so sorry to hear about your beautiful Callie. May she rest in peace. Love your new cupcake painting Catherine...they are wonderful. Absolutely scrumptious looking and adorable. 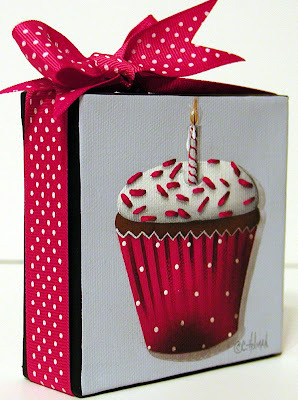 I always love your cupcake paintings. it's adorable,and the painting outstanting.